Just like Joseph, you can’t see the whole picture. Just like Joseph, your task is to see that Jesus is brought into your part of your world. And just like Joseph, you have a choice: to obey or disobey. Because Joseph obeyed, God used him to change the world. Can He do the same with you? God still looks for Josephs today. Men and women who believe that God is not through with this world. Common people who serve an uncommon God. Will you be that kind of person? Will you serve… even when you don’t understand? 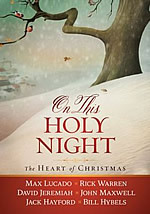 No, the Bethlehem sky is not the first to hear the pleadings of an honest heart, nor the last. And perhaps God didn’t answer every question for Joseph. But He answered the most important one. “Are you still with me, God?” And through the first cries of the Godchild the answer came.